There has been a little misunderstanding of the essential nature of movie making in some discussion of the movie Hugo. The train station in this movie is not a poor replica of any one station, but rather an amazing reconstruction using elements of several Paris train stations, as they were in the 1930’s. Here is Brian Selznick on the inspiration for important elements in his novel, the automaton and the train stations of Paris. Roughly then, it seems that the Musée D’Orsay had an initial influence and contributed a clock, and there are certain elements from the Gare de Lyon, and Gare Montparnasse, but the train station in the movie is largely a recontruction of the Gare du Nord. Here is an interview with Clive Lamming, the historian who served as consultant for the movie. He describes how the film crew for Hugo arrived first at the Gare Montparnasse, where Méliès had actually worked, only to find that the original station had been destroyed and replaced by a modern one. The team then went to the Gare du Nord, and had hoped to gain permission to film in the station. However, permission was not granted and so, using plans and documents supplied by Lamming, a set was built north of London, and a station was constructed based about 80% on the Gare du Nord. 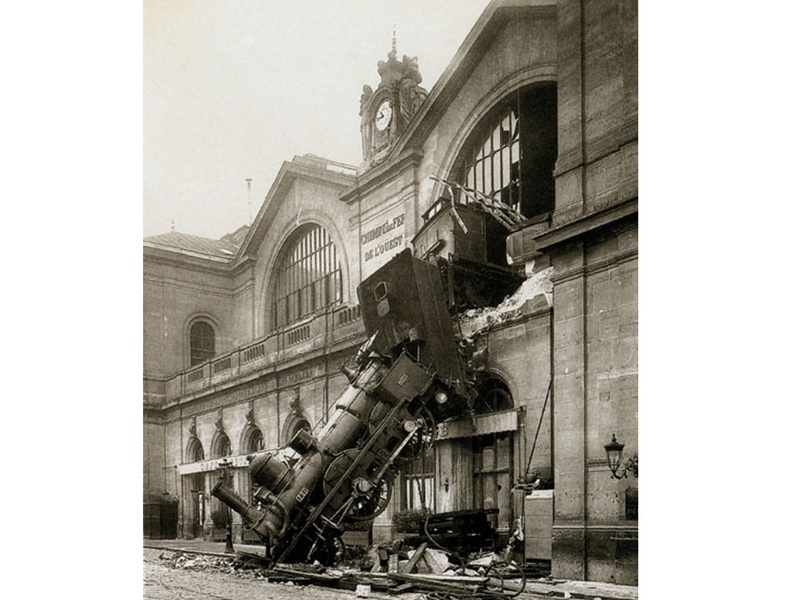 One particular element from the Gare Montparnasse is the derailment, which forms a dream sequence in the film. This guide also supplies some background to other locations in the film. It might have been half an hour after this altercation when, as I was deeply absorbed in the heavenly scenery beneath me, I was startled by something very cold which pressed with a gentle pressure on the back of my neck. It is needless to say that I felt inexpressibly alarmed. I knew that Pompey was beneath my feet, and that Diana was sitting, according to my explicit directions, upon her hind legs, in the farthest corner of the room. What could it be? Alas! I but too soon discovered. Turning my head gently to one side, I perceived, to my extreme horror, that the huge, glittering, scimetar-like minute-hand of the clock had, in the course of its hourly revolution, descended upon my neck. There was, I knew, not a second to be lost. I pulled back at once-but it was too late. There was no chance of forcing my head through the mouth of that terrible trap in which it was so fairly caught, and which grew narrower and narrower with a rapidity too horrible to be conceived. The agony of that moment is not to be imagined. I threw up my hands and endeavored, with all my strength, to force upward the ponderous iron bar. I might as well have tried to lift the cathedral itself. Down, down, down it came, closer and yet closer. And second, the much more pleasurable experience of eating in the café at the Musée D’Orsay.